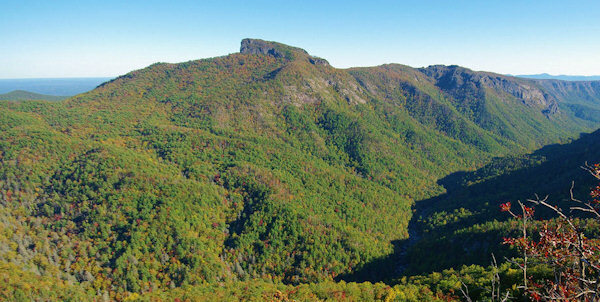 Table Rock Mountain's distinctive summit above Linville Gorge can be seen easily from many parts of the North Carolina mountains and foothills. The rocky summit is fun (and safe) to explore. The 2.2-mile roundtrip has some steep climbs, so it's a bit strenuous. 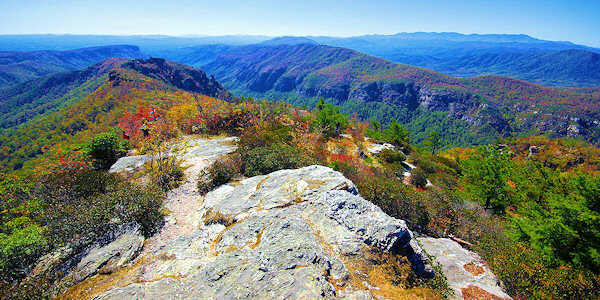 The views of Linville Gorge are spectacular from the 3,930-ft. peak. The road to the summit is open April-December. The trailhead to the summit hike is located 9.5 miles from Highway 181 in Burke County - including 7 miles on a one-lane, bumpy, unpaved Pisgah National Forest service road (not for low clearance sports cars). You will pass the trailhead to Hawksbill Mountain about five miles before you reach Table Rock. Table Rock has a nice parking area and picnic tables. The large "Table Rock" bulletin board marks the trailhead. Also, find some nice campsites near the parking area for easy set up! There are a few forks in the trail. About 1/2-mile up, keep to the right where a side trail leads downhill on your left. When you reach the top, cut through a narrow, overgrown trail to the left to get to a huge boulder that overlooks Hawksbill Mountain and Linville Gorge. Return toward the main trail and continue forward to walk along the top of Table Rock for many impressive vistas. There are many spots for a picnic with breathtaking views "on the edge." Table Rock is very popular for rock climbing. 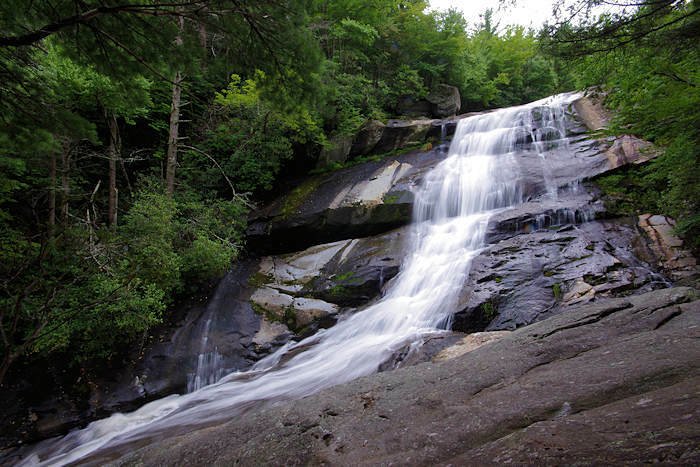 It is often described as having a national reputation for being the best place to climb in the southeastern United States. Table Rock is also known for its flora. 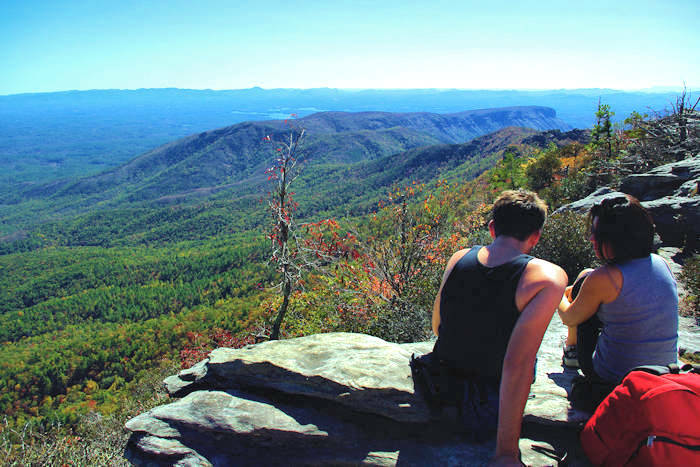 You can hike nearby Hawksbill Mountain on the same day. And from the Table Rock parking area, take the Mountain-to-Sea Trail in the opposite direction to hike to the Chimneys rock formations. 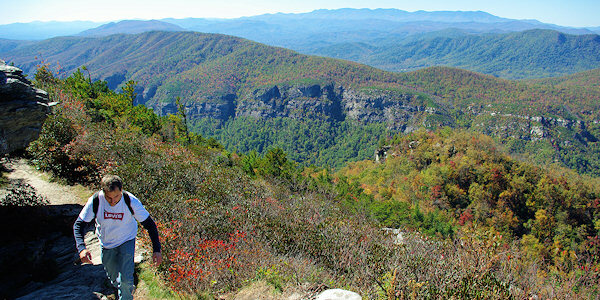 For a different view of Linville Gorge, hike nearby Shortoff Mountain. 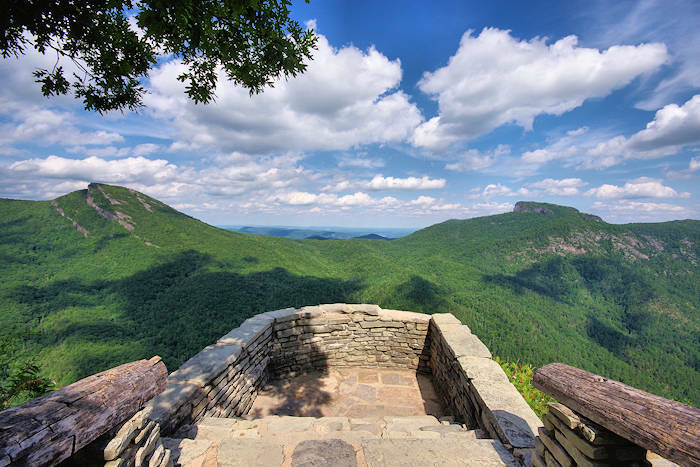 Drive to the opposite side of Linville Gorge to Wiseman's View for a great view of Table Rock. 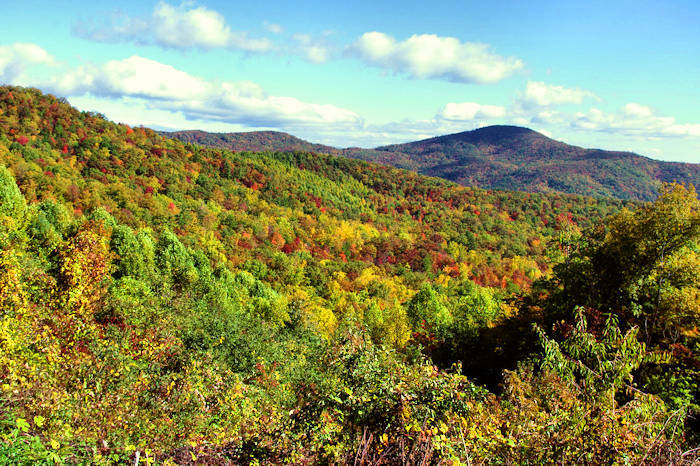 Driving Directions: The Table Rock Mountain hiking trail is about 70 miles from Asheville. The shortest route is via I-40 east to Marion. Then U.S. Highway 221 north to the Linville Falls area, then Highway 183 to Highway 181. Go south three miles on Highway 181 to Gingercake Road (the second intersection with Gingercake Rd). It's about four miles south of the Blue Ridge Parkway intersection with Highway 181. One-half-mile down Gingercake Rd, stay left (follow Table Rock sign) on Road 1264. The pavement ends in a mile. Go another 7 miles to reach the Table Rock Mountain hiking trail. It's open April-December (the road near the summit is closed January-March). 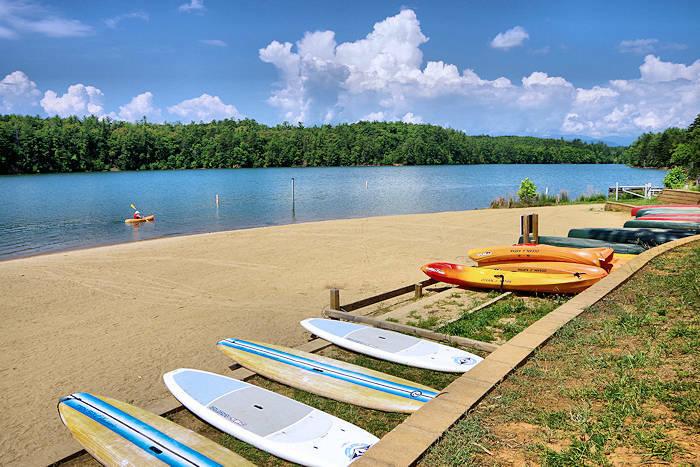 Camping also nearby at Lake James State Park.